Abdul Razak Awofeso was born 31 March 1978 in Lagos, Nigeria. He now lives in Braamfontein, Johannesburg. SA. In 2000 completed an Ordinary National Diploma (OND) at Yaba College Of Technology and in 2004 did Web design at Tnet IT training. 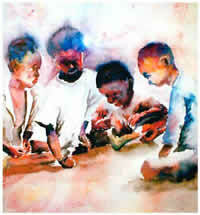 2000 - Worked With Universal Studios Of Art (Lagos) Jan-July 2000. Drawing and Painting. 2003 - "Small WONDERS" exhibition gallery vertigo, Vernon BC, Canada. 2003 - Conducted a Watercolor portraiture workshop for portrait students at the creative inner city initiative (CICI), Joubert Park, Johannesburg. 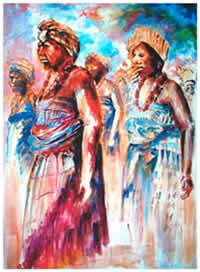 2003 - Group exhibtion - Gordart Gallery, Melville, Johannesburg. 2004 - Conducted a drawing and painting with coffee as medium for students workshop at the Lapeng Centre, Joubert Park. 2005 - "KNOT JUST ANY TIE" exhibition - Gordart gallery, Johannesburg. The Croatian Necktie Exhibition will be travelling to at least 20 countries. 2006 - Hope,healing and compassion" exhibition at suncity, rustenburg, South Africa. 2007- Solo Exhibition"fragile" at Maiden Alley Gallery, Paducah, Kentucky, USA.